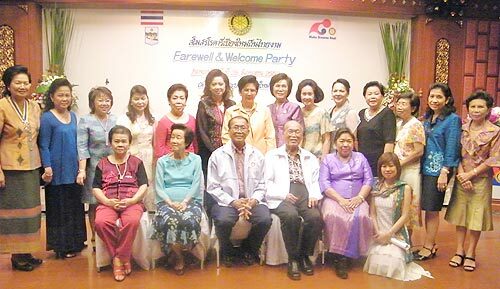 The Rotary Club of Chiang Mai Thin Thai Ngam Club on June 25, held its “Farewell & Welcome” for the outgoing president, Piamsuk Chantarat, left, and succeeding president Dr Ratree Pimphan, 7th left, at the Park Hotel in Chiang Mai. Dr Hans W.van Santen, the head of the Embassy of the Netherlands’ economic department and deputy head of the Embassy’s economic mission, last Wednesday hosted a dinner reception at Le Meridian for business people, entrepreneurs and NGO’s. 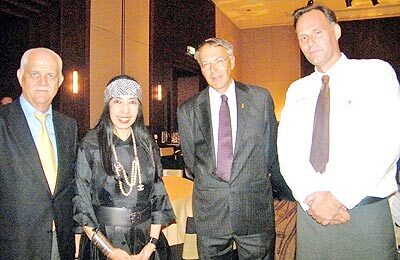 His guests of honour included the German honorary consul Hagen Dirkson, left. Sehapan Chumsai na Ayutthaya, (3rd right, font row) vice president of Nok Air, shown with his media group checking in at Le Meridien for an inspection tour of Chiang Mai tourist attractions. Welcoming him was the hotel’s manager, Ursula Schoefl, (centre), with her staff, Siriyanee Chai-ongkarn, (left), and Jirapa Chankitisakoon (2nd left). US Consul General Michael Morrow, (2nd right), pictured at the consular reception to celebrate Independence Day held at the US Consulate on July 1. 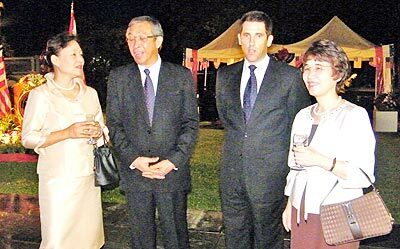 With him, from left, are Mrs. Thomas Baude, wife of the French Consul, Chiang Mai governor Amornphan Nimanant, and the Japanese Consul General, JunkoYokata. 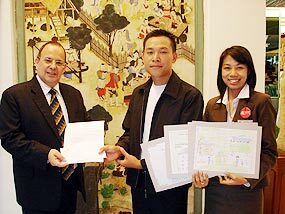 The Amari Rincome’s GM, Wim Fagel, pictured presenting a 5,000 baht scholarship to Sgt. Jumpol Khoonnam, a teacher from Chiang Mai’s Royal Border Police Benjama1 School. Students from various Chiang Mai schools entered their paintings for a competition held as part of the Amari Hotels & Resorts’ charity project, ‘Baht for a Better Life’.